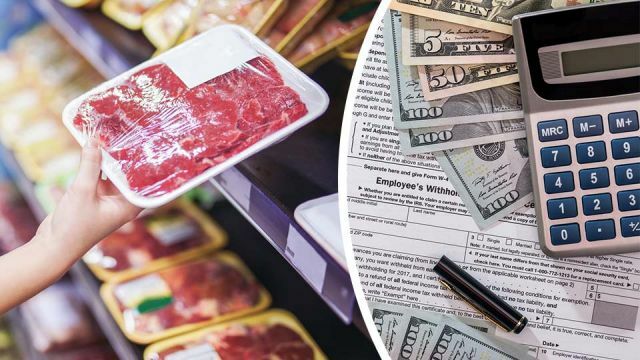 Would You Pay Taxes On Your Meat? Meat could be taxed in the future in order to reduce its impact on the climate and on human health, in much the same way there are carbon taxes and taxes on sugar and tobacco. Such a taxation is inevitable, according to investor network Farm Animal Investment Risk and Return (Fairr). The analysts with the network represent investors that manage altogether more than $4 trillion in assets. The global meat industry causes 15 percent of worldwide greenhouse gas emissions, and livestock cause other problems as well, including water pollution and antibiotic resistance. Germany, Denmark and Sweden’s parliaments have already discussed applying a meat tax (and in Germany’s case, a tax on cheese and eggs as well). China also reduced the maximum amount of meat it recommends consuming by 45 percent last year. If Germany increased its taxes on meat, that would likely see an increase in prices to consumers, while the tax on other healthier food products would be reduced below 7 percent. Meanwhile, Mexico has already imposed a tax on sugary drinks which have since seen reduced consumption of those by 10 percent per year. That tax was primarily applied in order to address national health issues. An analysis of meat taxes conducted last year found that a 40 percent tax on meat and 20 percent tax on eggs would save 500,000 lives, globally, and drastically reduce carbon emissions. Those supporting a meat tax argue that it is one of the best ways to influence people’s diet. “Influencing human behavior is one of the most challenging aspects of any large-scale policy, and it is unlikely that a large-scale dietary change will happen voluntarily without incentives,” said the authors of a study into reducing gas emissions from meat production. “Current levels of meat consumption are not healthy or sustainable. The costs associated with each of those impacts could approach the trillions in the future. Taxing meat could be a first and important step,” Marco Springmann, told The Guardian on behalf of the Oxford Martin Programme on the Future of Food. Maria Lettini, director of Fairr, said a meat tax could be implemented in five to ten years. If not taxes, then what? While most people agree that something needs to be done to curb the environmental damage inflicted by the meat industry, not everyone agrees on what that measure should be. Many people have argued for boosting the plant-based meat industry — that is, the fake meat industry. While processed meats especially have also been linked to heart disease, cancer, inflammation, and asthma — these meat alternatives are often much healthier and more environmentally friendly. Tyson Foods, for example, has created a plant-based burger, after spending years as a producer of chicken, beef and pork. Investors are also putting their money into startups like Impossible Foods, which makes a bleeding meat-free hamburger and vegetarian meatballs, among other products. Consumers can also make their own ground vegetable patties, using flavorful and nutritious ingredients such as onion, garlic, basil, tomato paste, walnuts, cauliflowers and more. Hey Buddy!, I found this information for you: "Would You Pay Taxes On Your Meat?". Here is the website link: https://www.thealternativedaily.com/does-the-us-need-a-meat-tax/. Thank you.